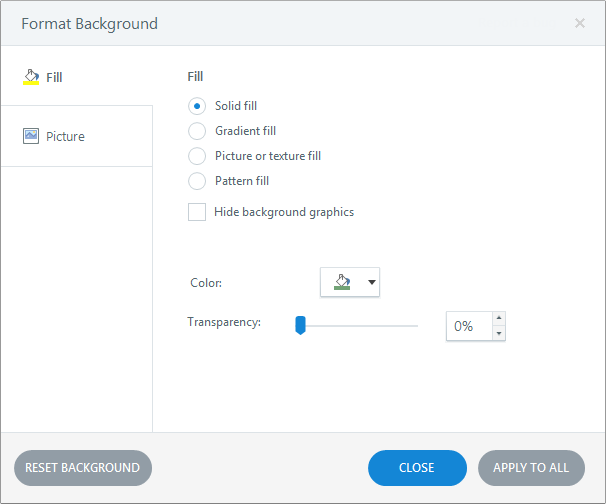 Changing your background design can have dramatic effects on the overall appearance of your course, and it's easy to do in Articulate Storyline. You can choose from several ready-made background styles or create your own. Go to the Design tab on the ribbon and click Background Styles. Hover over any thumbnail to see how the background style would look if applied to the current slide. To apply a background to all slides in your course, just click it (or right-click and choose Apply to All Slides). To apply a background to the currently selected slide(s), right-click and choose Apply Only to This Slide. Right-click the slide and choose Format Background. 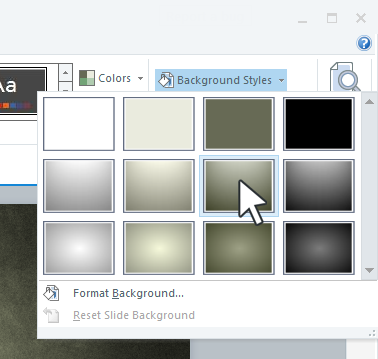 Go to the Design tab on the ribbon, click Background Styles, and choose Format Background. If your slide master has graphics that you don't want to include on the current slide, mark the box to Hide background graphics. To apply the same background design to all slides in your course, click Apply to All. If you change your mind about the edits you've made, click Reset Background.